Soil microorganisms may amplify the impacts of climate change by releasing greenhouse gasses into the atmosphere. But, if we survey these communities at single time-points, we can miss the big picture on their climate change feedbacks. However, obtaining time-series data is challenging with long-term climate change experiments in terms of soil sampling, site management, and personnel turnover. Soil microbial communities exert crucial controls on terrestrial carbon cycling. But, they are very complex in structure and are sensitive to changes in environmental conditions, so information obtained from a single time point provides only a snapshot of the microbial community. Imagine trying to predict the destination of a traveling vehicle using only its current speed and direction. You may have a good predictor in some situations, however frequently, this information could be quite misleading. 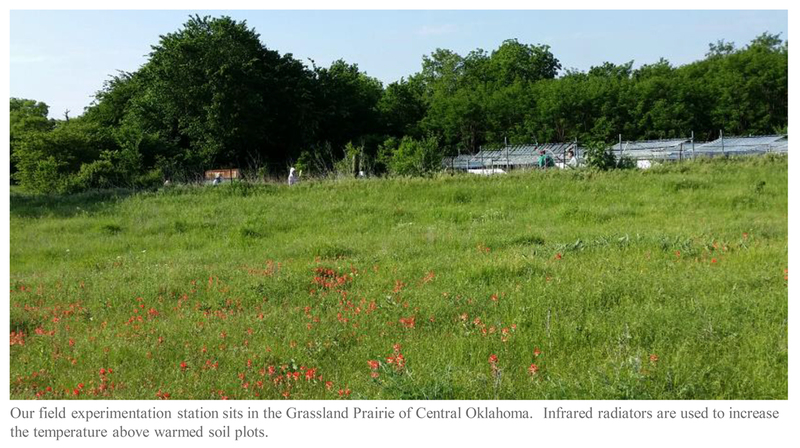 To address this, we investigate a set of experimental warming plots designed for examining ecosystem responses to climate change factors, altered temperature and precipitation, and land management, simulating grassland grazing/harvesting. This experimental facility has been run for nearly a decade. Our most important research task is to reveal the responses of soil microbial communities to climate changes over long-term successions at this site. Therefore, we archived soil samples from the site prior to initiation of the treatments and in October of each year. A major scientific limitation of these types of studies is the destructive nature of sampling, and hence the majority of long-term experiment sites do not allow periodic soil sampling due to small plot size. Picture a small plot being probed time after time to excise soil samples. The plot will eventually become a “swiss cheese” with too many holes to represent a natural soil ecosystem. To overcome this problem, we have used a small soil sampler to collect samples, and have carefully designed a sampling strategy and mapped every sample events. 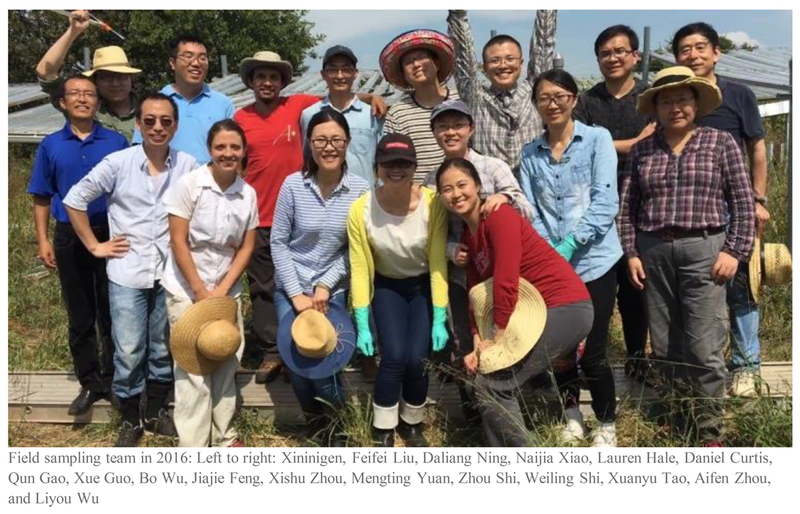 This study (link) combined empirical results of 6 years with more theoretical analyses to evaluate the temporal scaling of soil bacterial and fungal communities in response to multiple climate change factors. We examined the species-time relationship and phylogenetic-time relationship of the bacterial and fungal communities. Our results revealed that warming promotes temporal scaling rates of soil microbial biodiversity, suggesting that soil biodiversity preservation and ecosystem management strategies may need to be adjusted in a warmer world. Similar to our previous studies (ref.1-6), this finding provides fundamental insights into the impacts of climate on microbial communities. These time-series data are also being used to address other research questions, such as the impacts of warming on the relationships of biodiversity to ecosystem functioning, temperature sensitivity of soil respiration, and the effect of climate change on soil organic carbon dynamics and long-term projections. Maintaining a long-term experimental site requires a lot of time, effort, and collaboration from the entire research team. An important issue to consider is staff turnover due to students graduating, postdocs moving on to other positions, and visiting scholars/scientists returning to their home institutions. At any given point, a new set of graduate students or postdocs take on the responsibility of coordinating field site endeavors. To ensure the consistency of sampling and analysis, an IEG Handbook for the warming site was created and is used by all staff involved in the sampling and maintenance. To gather enough data to really being to understand the long-term responses of microbial communities to climate change factors, we held back publishing any papers on this long-term experiment until enough time points had been sampled and appropriately analyzed. This does slow down our research progress in terms of publications, but we believe that the hard work and sacrifice is worth the effort and that time-series studies are crucial for evaluating long-term responses of microbial communities to climate change under highly variable environmental conditions. We will continue maintaining this experimental site and collecting annual soil samples, hopefully for several more decades. We will learn more with each new year of synthesized data and look forward to reporting many research updates. Guo, X. et al. Climate warming leads to divergent succession of grassland microbial communities. Nature Climate Change 8, 813-818 (2018). Xue, K. et al. Tundra soil carbon is vulnerable to rapid microbial decomposition under climate warming. Nature Climate Change 6, 595 (2016). Zhou, J. et al. Microbial mediation of carbon-cycle feedbacks to climate warming. Nature Climate Change 2, 106 (2011). Cheng, L. et al. Warming enhances old organic carbon decomposition through altering functional microbial communities. The Isme Journal 11, 1825 (2017). Xue, K. et al. Warming Alters Expressions of Microbial Functional Genes Important to Ecosystem Functioning. Frontiers in Microbiology 7 (2016). Xue, K. et al. Annual Removal of Aboveground Plant Biomass Alters Soil Microbial Responses to Warming. mBio 7, e00976-00916 (2016).